Made from chrome plated brass with a stainless-steel shackle, the ABUS Submariner is designed to withstand the harshest of weather conditions. The vinyl protected chrome plated body makes the padlock completely rust proof – this padlock will stand the test of time under even the most extreme of weather conditions. Vinyl protected chrome plated brass body. Completely weatherproof – suited to the harshest of weather conditions. Stainless steel shackle and cylinder cover to offer complete water protection. Cylinder can be re-keyed to match an existing key. High precision pin tumbler cylinder with patented pinning window. 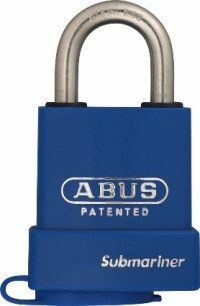 The ABUS submariner is a specialist high quality padlock that can be used for a range of outdoor applications, this could be dockyard gates where the weather is punishing, warehouse doors, shipping containers in transport, industrial plants, ports and other coastal and marine applications. If you require a strong padlock but weather conditions are not a concern, take a look at a selection of our range of padlocks designed to suit any application. If you require any other information about the ABUS Submariner 83WPIB/53 or any other products from our extensive range, give one of our expert team a call today on 0117 967 4994 to discuss your individual requirements.